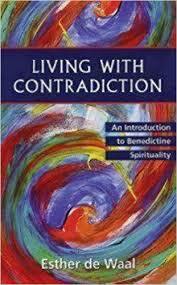 I have been a lover and follower of Benedictine Spirituality for almost 15 years. In my work as a Spiritual Director, I’m often asked how this came about. I wish I could say I was directed by a divine revelation from God, or that my deep, thoughtful studies of St. Benedict lead me there … no, nothing so honorable as either of those. It’s a sorted tale with four embarrassing themes, but the story has a good ending. So, I hope you’ll pardon me as I make my confession about the beginnings of my Benedictine Journey. So, I come from a faith tradition that doesn’t ordain women. A topic of great debate in these times. In humility, I willingly subjected myself to the authority of my tradition. I had been in a position of lay-leadership for 10 years. There was an agitation in my soul that would not go away. It all came to the surface when two men were ordained one October day. The service is beautiful. The two men took a vow to commit their lives to serve the lost and dying. It wasn’t that I craved ordination, I lamented that I could not make a vow to commit my life to God’s service (even though I was already serving God …) I confessed my irritation to my Spiritual Director, who suggested I look into becoming a Benedictine Oblate. My initial readings were confusing, and I was left with no certainty as to how this would offer me the “officialness” I craved. Then I met another woman who was also interested in committing her life to God’s service, in an official capacity. Without really understanding what I was doing, I signed on to become a Benedictine Associate, and began one of the richest, and most rewarding seasons of my Spiritual life. As I’ve mentioned, I had been a leader in my faith community for well over 10 years at this point. I had led most age groups; children, youth, adults, seniors. I knew chapter and verse. I knew how to use theological tools to explore any passage of Scripture. I knew the Gospels, inside and out. I worked hard to succeed in teaching and leading others as a woman in a male dominated field. Yet all my efforts in acquiring more knowledge, didn’t make me a better pastor, it just made me prouder of my accomplishments. More, bigger, & faster was my motto. But the motto of Benedictine Spirituality is PEACE, and the way is less, smaller, & slower. In my faith, I had gone a mile wide, but only a few inches deep. St. Benedict was calling me to a mile deep and only a few inches wide. This process was beginning to seep in when the Abbot of my community became gravely ill and died. Things folded up. 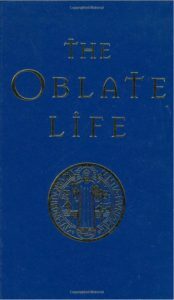 I knew of two other Abbeys and began the process of joining one of them as an Oblate. I chose Saint Andrew’s Abbey in Valyermo, California. I began attending their retreats and meetings. After developing a relationship with the Oblate Master, I asked to be received as an Oblate. Traditionally, you are admitted as an Associate after two years of prayer and study about St. Benedict. But I had already been an Oblate for yyyyeeearrrs. My request was met with, “Sure, you can transfer your Oblature. Let’s give it some time.” The Oblate Master made me wait TWO years before receiving me as an official lay member of their community. Sigh … less, smaller, & slower. I wasn’t at the top of my game, I was merely full of knowledge, and full of … myself. I needed the space for all my knowledge to seep down into my heart. There is one thing that Benedictine Spirituality has taught me, the goal of life is not perfection, the goal in life is to simply “be.” As a Benedictine Oblate, I have discovered that my life is a journey, not a destination. And this journey should be marked with intentional slowing down, and stillness. No longer am I troubled with the strife for perfection, I am allowed to be exactly who I am, at this moment. I am attentive to what is going on around me, and I am attentive to God’s movement. Many modern versions of this mindfulness have become popular in our busy world, but their goal is to empty oneself of anxiety and tension. The Benedictine slowing and stilling, is also an emptying, but to fullness, but not with self, but with God. The three vows of Benedictine way of life are: Obedience, Stability, and a Constant Conversion of heart. Obedience to God and to those in authority over you. Stability to the people and entities you have committed yourself to. (Be it your family, your career, your neighborhood, or your community.) The Constant Conversion is the work of depending on God to help you become the best version of yourself. The Benedictine way isn’t about perfection, it’s about being attentive to how God is at work in the imperfect moments of life. Benedictine Spirituality is especially relevant today. Never before have we struggled with our inability to focus and be present. We seek distractions from our distractions. Do we even know what the words Obedience, Stability mean? And what about a life of Constant Conversion? I have many recommendations on Benedictine Spirituality. Below are Amazon links to a few of my favorites. If you have specific questions about the Benedictine way of life, email me at the email link above. If you are ready to take your Spirituality to the next level, I’m ready to help you find the way. This little gem is an excellent introduction to the Benedictine way of life. The Rule of St. Benedict is full of common threads and Esther de Waal groups each of these threads into separate chapters. Weaving together a perfect overview of the key concepts found in Benedictine Spirituality. 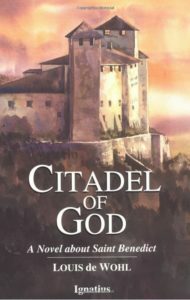 Historical fiction of the life of St. Benedict. Louis de Wohl places St. Benedict in the society with Boethius, interesting concept. The story brings the life of St. Benedict into context, lending itself to a realistic perception of the miracles attributed to the saint. 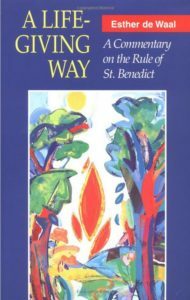 Another treasure by Esther de Waal, simple reflections from the Rule of St. Benedict that examine our world and the tension that we all must live in. Ancient wisdom for modern struggles. Peace is offered with a new perspective. 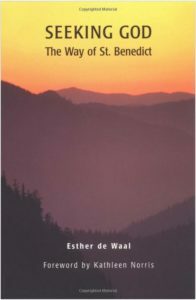 In this book Esther de Waal demonstrates the deep spirituality found within the text of the Rule of St. Benedict. She is able to bring ancient truths into our modern world with clarity and simplicity. Time honored companion for oblates, associates, and friends of Benedictine communities. 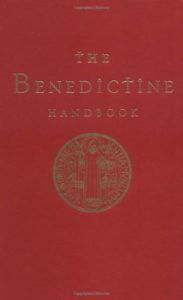 Contains the Rule of St. Benedict, devotions written by Benedictines and explanations of the Benedictine tenets and teachings. Most often found in guest rooms in Benedictine retreat centers. Companion to The Benedictine Handbook. Compilation of essays by modern day monastics and oblates from all over the United States. Designed to convey the wisdom, inspiration, and enlightenment of the Benedictine life. Although the numbers of men and women becoming monks and nuns are decreasing, the wisdom of their way of life is becoming essential to those living in the world.